Simplify camera and studio lighting balance with this three step gray-scale target for performing quick color adjustments and evaluating studio lighting conditions. The ColorChecker Grayscale includes the white, 18% gray, and black reference patches found in the 24-patch ColorChecker Classic, all on a single full-sized card. Use it to capture accurate color before your photo session or video shoot, and save yourself editing time and effort afterward. On site, use it as the first reference shot in a photo series or video footage to instantly correct color by balancing on the mid-tone gray value. In the studio, use it to evaluate exposure and balance between main and fill lights to quickly set up the proper lighting ratio, and to set white balance. The ColorChecker Grayscale target also provides reference values for adjusting colors within most common photo or video editing software packages, allowing you to make quick color adjustments. The ColorChecker Grayscale is scientifically engineered to provide a precise, uniform surface that is spectrally neutral (reflects equal amounts of red, blue and green) in all types of lighting conditions. 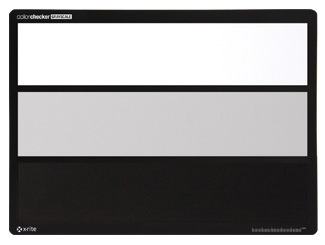 A full-sized target including the white, 18% gray, and black reference squares found in the 24-patch ColorChecker Classic target, which are scientifically engineered to provide a precise, uniform surface that is spectrally neutral (reflects equal amounts of red, blue and green) in all types of lighting conditions. On site, use it as the first reference shot in a photo series or video footage to instantly correct image color by balancing on the mid-tone gray value. In the studio, use it to evaluate exposure and balance between main and fill lights to quickly set up the proper lighting ratio, and to set white balance. The ColorChecker Grayscale target also provides reference values for adjusting colors within most common photo or video editing software packages, allowing you to make quick color adjustments.